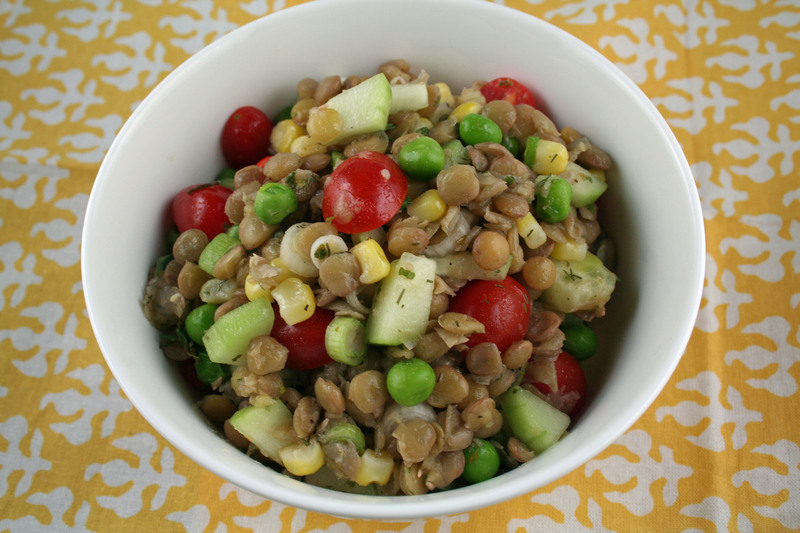 Lentil salad is quickly becoming an American classic. With the popularity of ancient grains and heirloom beans, legume salads are trending and gaining a new hipster following. Satisfying but simple, healthy, and high in protein (so it will keep you full longer). 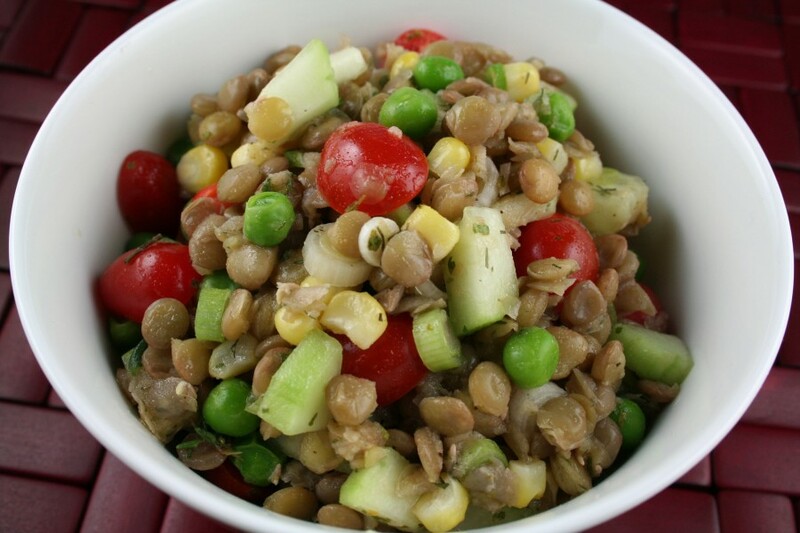 Lentils, which date back thousands of years and possibly originated in Eastern Europe or the Mediterranean, are getting a face lift in salads these days but are not completely unrecognizable compared to those of the 1960’s – when this recipe was most likely written. Unlike the original recipe titled “Marinated Lentil Salad” from “The Art of Good Cooking” that has parsley and scallions as its only fresh components, I used extra veggies so this salad can be eaten as a well rounded light lunch by itself. The crunch of the cucumber and the brightness of the herbs along with the smooth, slight tenderness of the lentils, shouts summer fresh. Prepare frozen corn and peas according to package instructions or cook in boiling water for 2-3 minutes and drain. Set aside. Pick over lentils and wash them well. Place in pot, add water, and bring to a boil. Lower heat and simmer until tender, about 30-40 minutes. Scoop out any loose shells that floated to the top while cooking. Drain. Add salt, pepper, oil and vinegar. Then cool to room temperature. Add green onions, cucumber, corn and peas, parsley, dill or thyme (if using), and grape tomatoes.